Australia's largest toy collection, NSW Railway memorabilia, five hectares of beautiful cool-climate gardens by Paul Sorensen, spectacular valley views, a grand art deco mansion and quite a bit of (royal) history. Leuralla was built for the independently wealthy yachtsman, sportsman and big game fisherman Harry Andreas, his wife Alice and their young family in 1912. Edward, Prince of Wales (later King Edward VIII) visited Australia in 1920 to thank the nation, their people and troops for their participation in the Great War. During his stay, Prince Edward met with Andreas, who took him yachting on SYdney Harbour. 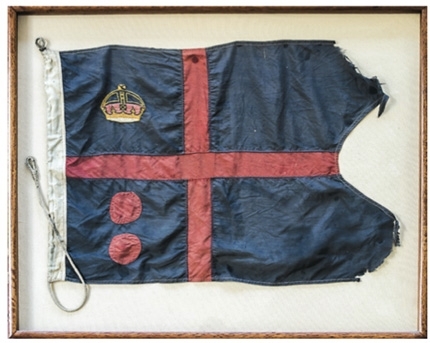 By way of thank you, the Prince presented two nautical flags to Andreas, both of which are on exhibit at Leuralla (below). During the 1927 Royal Visit of Australia, Andreas hosted a game fishing expedition for the Duke and Duchess of York (Later King George VI and Queen Elizabeth) in the Bay of Isles in New Zealand, where he had fished with the noted American author and adventurer Zane Grey (opposite). 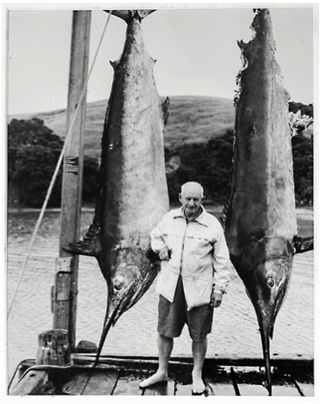 (Right) Harry Andreas, yachtsman, big game fisherman and builder of Leuralla. Pictured in the Bay of Isles where he later hosted the Duke and Duchess of York in 1927. 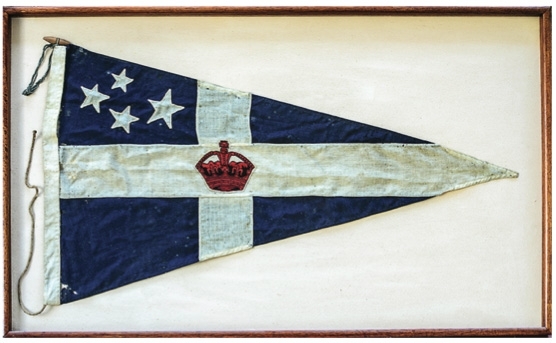 The nautical flags presented to Andreas by Edward, Prince of Wales in 1920. Both are on exhibit at Leuralla. While her parents were fishing with Andreas, the young Princess Elizabeth (later Queen Elizabeth II) was at home in London. 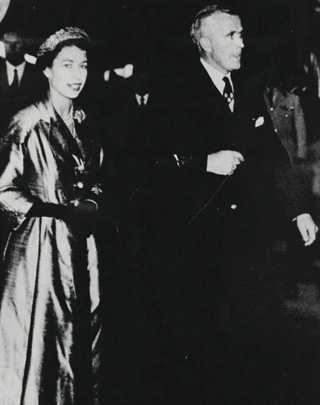 Almost twenty five years later, during the 1954 Royal Visit to Australia, Andreas welcomed Her Majesty the Queen and His Royal Highness the Duke of Edinburgh's guests at Leuralla. 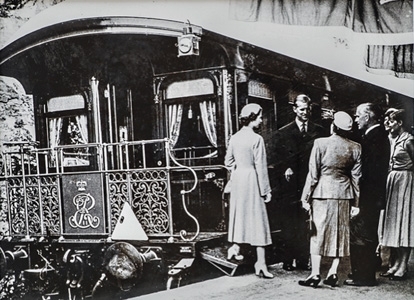 Queen Elizabeth II was met at Leura Station by Andreas' son-in-law Clive R. Evatt, then State Minister for Art and Education and brother of renowned "Doc" H.V. Evatt, wartime Foreign Minister and inaugural President of the United Nation's General Assembly in 1947. 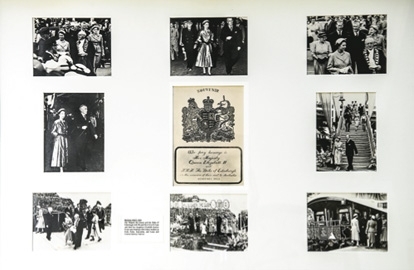 Pictured below are Her Majesty the Queen and the Duke of Edinburgh, accompanied by Mr and Mrs Clive R. Evatt and their two daughters, (later) Justice Elizabeth Evatt and Penelope Seidler at a Jamison Valley lookout overlooking Mount Solitary and the Three Sisters (adjacent to the Leuralla Amphitheatre); and also at Leura Station, upon the Royal Persons' arrival. 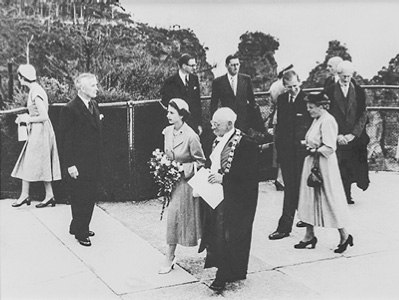 (Right) Clive R. Evatt, Andreas' son-in-law, escorts Her Majesty Queen Elizabeth II during the Royal Visit of 1954.
at a Jamison Valley lookout (adjacent to the Leuralla Amphitheatre). Clive Evatt Jnr and his wife, Elizabeth, now run the Toy & Railway Museum at Leuralla and honour the house and family's connections to the Royal Family. 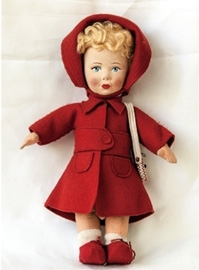 The museum has dedicated displays to the Royal Family, featuring models of Princesses Elizabeth and Margaret, which the Queen Mother had commissioned from British doll maker Chad Valley in the 1930s (below). 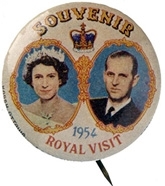 Items on display also include the finely executed models of the Duke of Windsor's Rolls Royce vehicles, a jigsaw featuring Their Royal Majesties and a recently acquired 'Princess Catherine Doll' together with a large collection of photographs documenting the Royal Visit to the Mountains (below) and other historical Royal memorabilia. 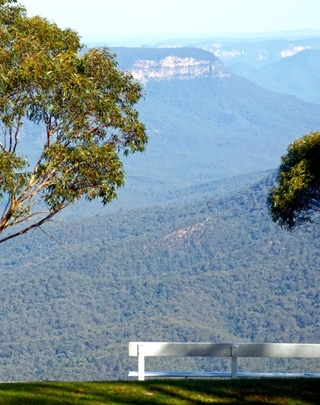 (Right) View from Leuralla Amphitheatre of Mount Solitary and Jamison Valley.01. Modern day Princess Catherine doll.